• Stereotactic radiotherapy may be beneficial for patients who are incomplete responders or non responders to anti-VEGF monotherapy. • Using multiple approaches at the same time can offer benefits not achievable with monotherapy in the treatment of wet age-related macular degeneration. VEGF is an angiogenic mitogen specific for vascular endothelial cells that induce angiogenesis (ie, endothelial cell proliferation) and increased vascular permeability. Anti-VEGF agents decrease the vascular permeability of choroidal neovascular (CNV) lesions by binding to VEGF, thus preventing the vision loss caused by retinal edema. However, the size of the CNV lesion may not change—and the vessels may become permeable—if the eye produces more VEGF than can be inhibited by the anti-VEGF agent.12 Patients with this condition may be termed lowresponders or nonresponders. Tachyphylaxis has also been reported as a cause of anti-VEGF nonresponse.13-15 In clinical practice, many patients experience suboptimal visual outcomes despite pharmacologic intervention with anti-VEGF therapy. Ionizing radiation (IR) has been proposed as an adjunct to anti-VEGF therapy in the long-term management of patients with wet AMD, similar to the combination approach used in oncology for angiogenic tumors. IR disrupts cell mitosis through direct or indirect damage to cellular DNA, thus blunting the formation of new blood vessels. It acts preferentially on cells with rapid cell division cycles (ie, weeks or months), including vascular endothelial cells associated with CNV lesions. Mature cells and cells that are mitotically inactive engage intracellular mechanisms to repair DNA damage and remain viable. Figure 1. When selecting patients for x-ray SRT, measure the lesion greatest linear dimension using FA (top middle) or en face OCT images (top right). When using OCT B-scans, cycle through consecutive cross-sectional images to find the image depicting the longest lesion length (bottom left). The significance and amount of macular fluid can be quantified using ETDRS sector average thickness with normative data color coding (bottom middle) or macular thickness maps (bottom right). The INTREPID study of stereotactic radiotherapy (SRT) was a randomized, double blind, sham-controlled study among patients with wet AMD of the effect of SRT plus PRN anti-VEGF agent or sham SRT plus PRN anti-VEGF agent. The primary endpoint was mean number of anti-VEGF injections at 1 year. The study design and results have been previously reported.17-19 The study recruited patients with at least three anti-VEGF injections in the previous year who had the need for an additional injection due to continued or recurrent exudative disease activity as determined with optical coherence tomography (OCT) or fluorescein angiography (FA). CNV lesion size was limited to 6 mm in greatest linear dimension. On average, patients entered the study 15 months after diagnosis with wet AMD and had received about 6 injections prior to inclusion. The study met its primary endpoint; patients receiving SRT required 33% fewer injections at 1 year (P = .001) compared with patients receiving sham radiation, while maintaining equivalent vision. At 1 year, 91% of patients in each of the SRT and sham SRT arms lost fewer than 15 letters of visual acuity. In a post hoc analysis of the influence of baseline characteristics, the greatest benefit was seen in eyes in which the CNV lesion was 4 mm or less in greatest linear dimension and which also experienced significant exudative activity (defined as macular volume > 95% of normal on OCT). In eyes with both of these characteristics, there was a 55% reduction in number of injections (P = .0002) and a greater letter gain of visual acuity compared with sham (P = .028).19 In relation to the first of these two characteristics, it is notable that the x-ray beam spot size used in the study was 4 mm in diameter. The treatment benefits persisted through year 2, with significant 25% and 45% reductions in the number of injections in the full cohort and the best-responder group, respectively. SRT using the IRay system has been available for integration into routine care since early 2013 in the United Kingdom, Germany, and Switzerland. (The device is investigational in the United States.) The first systems were predominantly used in university or public hospital eye clinics, but also a few private eye hospitals. The IRay system uses low-voltage x-ray and integrated shielding to limit radiation scatter and obviate the need for shielding as part of the treatment in almost all installations. The IRay system is easy to integrate into routine clinical practice; however, use of the system requires training in radiotherapy and medical physics (or staff familiar with these) both to assure proper maintenance of the device and to provide the proper patient education necessary for informed consent. Figure 2. OCT can be used to quantify macular thickness within ETDRS sectors and color each sector based on normative data. In these maps, normal is green, and abnormally thick is pale yellow (95th percentile) or pink (99th percentile) (A). Because the IRay system targets a 4.0 mm spot centered on the fovea, look for central involvement. Macular volume may also be quantified with normative data (B). One challenge of integrating the IRay into practice is to extrapolate data from the INTREPID trial to help determine which patients to treat and when. At a recent manufacturer-sponsored symposium, early adopters of this technology shared how they are approaching the question of which patients to treat.20 The speakers all said they typically select patients for therapy who meet the profile of best responders from INTREPID, that is, with lesion size less than or equal to 4.0 mm and significant, persistent edema as seen on OCT. The absence of fibrosis was also predictive of better clinical outcomes in INTREPID.19 However, most patients with chronic CNV have some degree of fibrosis, so these early adopters noted that they generally select patients for therapy with minimal central fibrosis and scarring. Figure 3. Macular thickness maps offer a quick way to screen patients. The top row presents patients with significant macular fluid centered on the fovea; thus, these are potential candidates for SRT. The bottom row includes images of maculas with lesser degrees of edema or with edema located predominantly outside of the central macula; thus, these eyes are likely not good candidates for SRT. The INTREPID results indicated that neither time since diagnosis nor number of previous injections was predictive of outcomes, so the aforementioned anatomic parameters appear to be the best indicators of potential benefit. CNV lesion size can be measured on FA images or by using OCT B-scans or en face images (Figure 1). Abnormal macular volume or thickness can be measured quantitatively using OCT. OCT manufacturers provide various analytics (eg, color coding) to indicate whether a measurement is abnormal (Figure 2). When macular thickness is used to identify lesions that are likely to benefit from IRay, use of central subfield thickness alone is not recommended; rather, the criterion should be presence of abnormal thickness in a majority of ETDRS sectors with central involvement. Qualitatively, OCT macular thickness maps may be helpful for the initial screening of patients (Figure 3). In patients who are incomplete responders or nonresponders to anti-VEGF monotherapy. Incomplete response or nonresponse can be defined as no improvement or regression in visual acuity or morphology. Currently there is no clear consensus on the number of injections administered before a patient can be considered not sufficiently or unresponsive to therapy: it has been identified after as few as three monthly injections.21,22 In this circumstance, the adjunctive use of SRT would be intended to bring the disease under control, thus permitting anti-VEGF therapy to maintain a dry macula. In patients whose AMD may be controllable with anti-VEGF, but who require more frequent injections than can be administered practically. The goal in this situation would be to reduce treatment burden. In patients at initial diagnosis, during a disease recurrence after extended quiescence, or who are switching anti-VEGF agents, incorporating SRT during the anti-VEGF loading phase may help reduce the rate of incomplete response or nonresponse and prolong visual acuity gains that have been achieved with fewer injections. It may be optimal to administer SRT with the first loading dose so that the subsequent two injections can help control AMD disease activity while the radiotherapy takes effect (usually 1-3 months). Aljoscha S. Neubauer, MD, MBA, is in private practice in Munich and is an associate professor in the department of ophthalmology at Ludwig-Maximilians University Munich, Germany. He is a consultant to ContraCare, GmbH. Dr. Neubauer may be reached at aljoscha.neubauer@kabelmail.de. 1. Brown DM, Kaiser PK, Michels M, et al. Ranibizumab versus verteporfin for neovascular age-related macular degeneration. N Engl J Med. 2006;355(14):1432-1444. 2. Rosenfeld PJ, Brown DM, Heier JS, et al. Ranibizumab for neovascular age-related macular degeneration. N Engl J Med. 2006;355(14):1419-1431. 4. Peden MC, Suñer IJ, Hammer ME, et al. Long-term outcomes in eyes receiving fixed-interval dosing of anti-vascular endothelial growth factor agents for wet age-related macular degeneration. Ophthalmology. 2015;122(4):803-808. 5. Martin DF, Maguire MG, Fine SL, et al; Comparison of Age-related Macular Degeneration Treatments Trials (CATT) Research Group. Ranibizumab and bevacizumab for neovascular age-related macular degeneration: two-year results. Ophthalmology. 2012;119(7):1388-1398. 6. Regillo CD, Brown DM, Abraham P, et al. Randomized, double-masked, sham-controlled trial of ranibizumab for neovascular age-related macular degeneration: PIER study Year 1. Am J Ophthalmol. 2008;145(2):239-248e5. 7. Holz FG, Amoaku W, Donate J, et al. Safety and efficacy of a flexible dosing regimen of ranibizumab in neovascular age-related macular degeneration: the SUSTAIN study. Ophthalmology. 2011;118(4):663-671. 8. Schmidt-Erfurth U, Eldem B, Guymer R, et al. Efficacy and safety of monthly versus quarterly ranibizumab treatment in neovascular age-related macular degeneration: the EXCITE study. Ophthalmology. 2011;118(5):831-839. 9. Holz FG, Tadayoni R, Beatty S, et al. Multi-country real-life experience of anti-vascular endothelial growth factor therapy for wet age-related macular degeneration. Br J Ophthalmol. 2015;99(2):220-226. 10. Tufail A, Xing W, Johnston R, et al; Writing Committee for the UK Age-Related Macular Degeneration EMR Users Group. The neovascular age-related macular degeneration database: multicenter study of 92 976 ranibizumab injections: report 1: visual acuity. Ophthalmology. 2014;121(5):1092-1101. 11. Stewart MW, Rosenfeld PJ, Penha FM, et al. Pharmacokinetic rationale for dosing every 2 weeks versus 4 weeks with intravitreal ranibizumab, bevacizumab, and aflibercept (vascular endothelial growth factor Trap-eye). Retina. 2012;32(3):434-457. 12. Schmidt-Erfurth U, Waldstein SM, Deak GG, et al. Pigment epithelial detachment followed by retinal cystoid degeneration leads to vision loss in treatment of neovascular age-related macular degeneration. Ophthalmology. 2015;122(4):822-832. 13. Forooghian F, Cukras C, Meyerle CB, et al. Tachyphylaxis after intravitreal bevacizumab for exudative age-related macular degeneration. Retina. 2009;29(6):723-731. 14. Gasperini JL, Fawzi AA, Khondkaryan A, et al. Bevacizumab and ranibizumab tachyphylaxis in the treatment of choroidal neovascularisation. Br J Ophthalmol. 2012;96(1):14-20. 15. Eghøj MS, Sørensen TL. Tachyphylaxis during treatment of exudative age-related macular degeneration with ranibizumab. Br J Ophthalmol. 2012;96(1):21-23. 16. Timke C, Zieher H, Roth A, et al. Combination of vascular endothelial growth factor receptor/platelet-derived growth factor receptor inhibition markedly improves radiation tumor therapy. Clin Cancer Res. 2008;14(7):2210-2219. 17. Jackson TL, Chakravarthy U, Kaiser PK, et al; INTREPID Study Group. Stereotactic radiotherapy for neovascular age-related macular degeneration: 52-week safety and efficacy results of the INTREPID study. Ophthalmology. 2013;120(9):1893-1900. 18. Jackson TL, Chakravarthy U, Slakter JS, et al; INTREPID Study Group. Stereotactic radiotherapy for neovascular age-related macular degeneration: year 2 results of the INTREPID study. Ophthalmology. 2015;122(1):138-145. 19. Jackson TL, Shusterman EM, Arnoldussen M, et al; INTREPID Study Group. Stereotactic radiotherapy for wet age-related macular degeneration (INTREPID): influence of baseline characteristics on clinical response. Retina. 2015;35(2):194-204. 20. Jackson TL, Rennie I, Aslam T, Hatz K, Grisanti S, Brand C. See the Impact of Oraya Therapy on Wet AMD patients. Symposia presented at 14th EURETINA Congress 13 September 2014, London UK. 21. Korb C, Zwiener I, Lorenz K, et al. Risk factors of a reduced response to ranibizumab treatment for neovascular age-related macular degeneration--evaluation in a clinical setting. BMC Ophthalmol. 2013;13:84. 22. Ehlken C, Jungmann S, Böhringer D, et al. 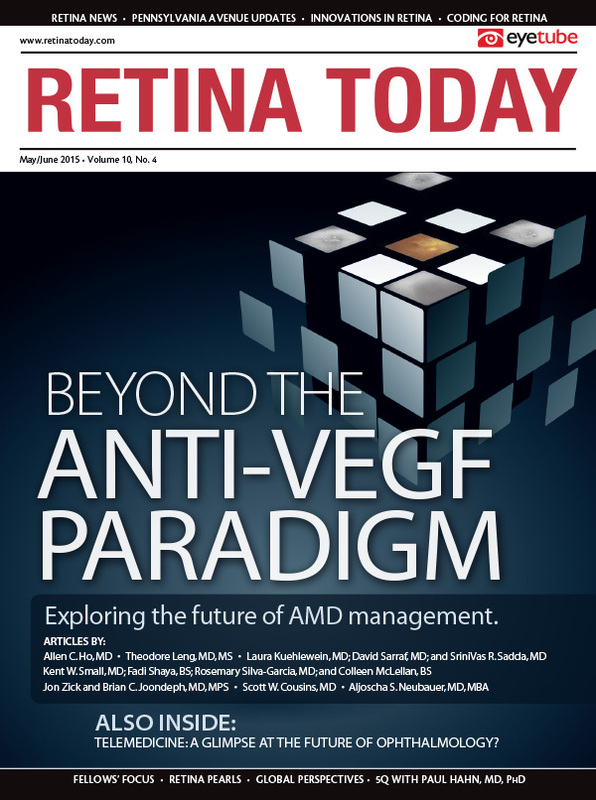 Switch of anti-VEGF agents is an option for nonresponders in the treatment of AMD. Eye (Lond). 2014;28(5):538-545.